This anytime-anywhere douche is specifically made for those encounters when you don’t have time to fully prepare. The silicone nozzle comes with 2 threaded adapters that fit most water bottles. This must-have man on man tool is designed to fit in your back pocket for an on-the-go clean for those inopportune moments that you just can’t pass up. Forget finding a shower hose, just find a bottle of water, screw it on, and you’re ready to go! The powerful and iconic Boneyard-branded design has a sleek 5-hole silicone nozzle and features 2 different threaded adapters that fit most water bottles. The kit also comes with a hose adapter so you can use the nozzle on your favorite shower hose. Ideal for travel, on-the-go, and everyday use. 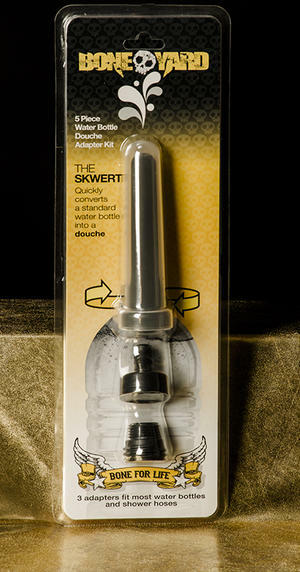 You can be assured the Skwert will get you through the punishment of your longest play sessions time and time again. The 4” silicone nozzle is 100% soft touch silicone. The adapters are solid ABS construction with a small thread and large thread fitting for a non-leak fit. The kit also comes with a standard thread shower hose adapter and sanitary storage cap. This product is safe with all lubricants, completely hypoallergenic, non-irritating and compatible with sensitive skin. Care Instructions:Wash thoroughly with mild soap and warm water or toy cleaner. Pat dry and allow product to completely air dry. Store separately.